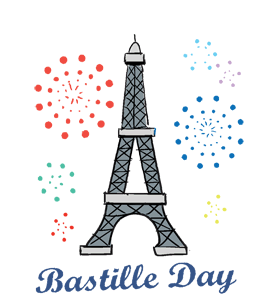 ﻿Bastille Day: Calendar, History, Tweets, Facts, Quotes & Activities. Bastille Day marks the anniversary of the attacks on the French prison of Bastille, a symbol of King Louis XVI's power. On, July 14, 1789, a group of Parisian revolutionaries attacked the Bastille looking for gun powder to go with the rifles they had recently stolen from the Invalides. The revolutionaries stormed the prison, defeating the soldiers and bringing victory to the common people of France. This event marked the beginning of the French Revolution, the defeat of a monarchy and the birth of a republic as King Louis XVI was beheaded by use of a guillotine on July 21, 1793 in front of a crowd of Parisians. The anniversary of this attack is now the French National holiday and is observed on July 14th each year. The theme for Bastille Day in Paris for 2017 was Operational together. The French Revolution was brought about partially due to the unequal class system found in France during the late 1700s. The Catholic clergy held the highest position, next came Louis XVI and his court, and lastly were the general population. Without the benefit of being born into a higher class, the general population had almost no hope of every bettering their station in life. Louis XVI's spending at Versailles and his financial support of the American Revolutionary War against the British, placed France in severe economic crisis. The general population was starving while King Louix XVI was building a great navy and continuing his lavish lifestyle in Versailles. The French flag consists of blue, white and red. White was the colour of the Monarchy and red and blue represented Paris. During the Revolution, the white was surrounded by blue and then red. Watch the Fireworks at the Eiffel Tower. They usually start around 11pm and can be viewed from the Champs de Mars and Trocadero. Attend a French military parade. Visit a French national museum as most are free to visit on Bastille Day or visit a local firehouse in France - they are open to the public on this holiday. Go out to a French Restaurant. Many have specials for this day.